Home Psychology of Technology What is the Biggest Danger of Technology? There are a lot of “techno-evangelists” out there spreading the gospel of technology as the cure for all of our ills. For this group, technology can do no wrong. At the same time, there are plenty of Chicken Littles running around saying that our cultural, social, and educational sky is falling. For this group, technology is the ill that needs to be cured. I place myself firmly in the middle of these two camps. 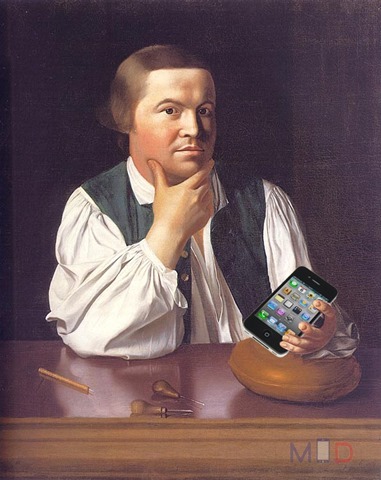 Think of me as the Paul Revere of the century—“The techies are coming!” I believe that technology is inherently neither good nor 21st bad. But neutral does not mean it is benign. As with most things in life, technology is healthy or harmful depending on how it is used. One challenge for us is technology enters our lives before we can know what effect it will actually have on us. The speed at which technology is becoming deeply woven into the very fabric of our lives is breathtaking; as if we’re holding onto the railing of a caboose of a runaway train. Innovations are launched and become a part of our culture so quickly that there isn’t time to step back and consider the implications of new technology on us. It is only in the rearview mirror that we can see whether a technological advancement has been beneficial or damaging. And by then it’s too late to go back; the new technology is already irreversibly embedded in our individual and societal psyches. There is no doubt that technology brings some wonderful benefits to our lives. It connects us in more ways. We can collaborate more effectively. We can reach others over many miles. A universe of information is at our fingertips. The list goes on and on. There is also no doubt that technology causes some real problems to our lives. Internet addiction seems to be very real. Cyberbullying is harming our children. Technology is causing a shift from self-expression to self-promotion. Loss of our privacy is unsettling. Our government’s use of technology is a real concern. Again, the list goes on and on. But, as the Paul Revere of technology, of all of the fears, worries, and doubts that concern me, there is one that sits at the top of my list. I’m talking about opportunity costs. If you are unfamiliar with this term, it is used for deciding how to best allocate resources, such as time and money, that are limited. Opportunity costs are typically defined as time spent on one thing is time not spent doing something else of greater value. Applied to technology, when time is devoted screens, there are costs in terms of the loss of potential benefits that might be gained from other activities in which we might engage. Given that a 2009 Kaiser Foundation survey (the fourth in this series is due out later this year) found that children 8-18 years old spend more than 7.5 hours a day in front of non-school-related screens (e.g., TV, video games, movies, tablets, smartphones). That adds up to a whole of opportunity costs. What specifically are children losing out on with their substantial tech time? Let me count the ways: sleep (kids aren’t getting enough), exercise (ditto), diet (kids in front of screens eat more junk food), direct human interaction (less of it), play (old-school style), arts (which may hurt creativity), homework (not doing enough of it or staying up late finishing it), and attention to and from their parents (the more, the better). Children are also incurring some other substantial opportunity costs in several important areas of their development. If you believe that dealing with emotions in a healthy way involve skills that require experience and practice (I definitely do), there is little doubt that time in front of screens means less time and practice with their emotional lives. The same holds true for relationships through which children learn empathy, respect, patience, and compassion, and many other values (is there an app for that?). Tech time also means less time reading which has demonstrably clear benefits to children’s intellectual and academic development. And, though I haven’t seen any research on it yet, I think it’s safe to say that many adults these days also spend too much time with technology. While perhaps not accumulating as much screen time as children, they are also suffering some of the same opportunity costs as children do. My final question is: What can we do about this problem of opportunity costs with technology in our lives? Well, unless an electromagnetic pulse destroys the computer and communication grid (trivia question: what 2000 TV show used that premise and who was its star? ), I don’t see mass departures from the “matrix.” Nor do I see our government encouraging disconnection (now that would be hypocrisy) or schools supporting limits (they’re heading in the other direction). Ultimately, the time that people spend in front of screens will be individual decisions made by themselves or, in families, by parents. I hope that this post opens the eyes of people to the hidden danger of technology, namely, the opportunity costs that they and their children are suffering. With this realization, all I can really hope for is that people will see that less screen time will provide them with big rewards in so many aspects of their lives. As you said it is about what you do with it. My daughter is gifted at dance and other creative outlets. Creativity impacts the spirit and no amount of technology training can get the job done of impacting other’s spirits. I can use technology to broadcast her talents but she has to be able to connect with the person experiencing her gift. Balancing the need to be comfortable with technology with the realization that we are human and don’t live alone for a reason is key. I’m glad you were able to articulate it much better than I could. Couldn’t agree with you more Dr. Jim. It scares me to see how much time young people (at 58, young is anyone under 30) spend on what I would describe as meaningless time in front of a screen. My 26 year old nephew, who I live with, spends a good amount of time playing Titanfall (used to be COD, then GTA) instead of creating or remixing music (his passion). Maybe I don’t understand how this gameplay is rewarding in some way. But, especially at my age, I see his days and weeks slip away without any benefits. But it could be worse. A friend of my nephew’s moved in a couple months ago (some family spat). To add to the confusion, I’ll call him Jim. Jim is 24 years old and just received his degree in, wait for it, psychology. But that’s not his passion. He plays some anime online boxing game, where you assume a character and box it out on screen using some joystick thingy. For his particular character, he is now the second best in the world. I watched him, as tens of thousands also did via his Kinect, two weeks ago, beat the previous world champion, twice. He lives on pizza, seriously. Jim’s a good kid who drives a shuttle bus a few days a week, between classes, to earn some money. But I am not sure how this 40-50 hours (I think I am being conservative here) of gameplay per week will benefit his career. He is now planning to start working on his Masters Degree, in between game play of course. Although he, like many youngins, is a bit naive, we have had some healthy discussions. He is a bright kid. I just don’t get it. I spend a lot of time in front of screens each day, but limit my total exposure to social stuff (FB & Twitter) to about 30-40 minutes max. And of course, staffnotify. The rest of the time is research or reading tech, world, US and local news. They may not be novels, but I do feel I am learning something every day. Jim and I are both exercising our brains in different way, but I think I would do better at Trivia Pursuit. Just sayin.